The protesters may be exhausted, but China’s problems with Hong Kong most definitely remain. After two long months, Hong Kong’s pro-democracy protesters are exhausted and divided. Their attempt last week to escalate the movement by encircling the government headquarters was foiled by police batons, pepper spray and arrests. Subsequently, the radical student leader Joshua Wong went on a hunger strike (since ended) while the co-founders of the Occupy Central Movement, which initiated the mass protests, renewed their call for the students to retreat. This internal division highlights the fact that the students have run out of viable options. Beijing may soon happily claim a hard-won victory. Yet in reality, Beijing is losing Hong Kong. While Beijing promises “one country, two systems,” it struggles to integrate Hong Kong economically with mainland China and to bring Hong Kongers into the fold of a common Chinese identity. The ultimate goal is to unite China and Hong Kong into one country. To this end, Beijing has given the city’s investors and businesses preferential access to the Chinese market. It promotes people-to-people exchanges by lifting tourist restrictions for mainland Chinese to travel to Hong Kong. It has also tried to introduce “patriotic education” into the curriculum of Hong Kong’s schools. Beijing has been quite successful in bringing Hong Kong closer to China economically. Last year, a staggering 40 million mainland visitors contributed a third of the city’s total retail revenue. Today, roughly half of the city’s commerce is with China. Its goal of winning the loyalty of the people there, however, has become increasingly out of reach. Hong Kong residents complain about rising commodity and housing prices caused by a tsunami of mainland visitors and investors. Young people are increasingly fearful of losing out to mainland Chinese as they compete for top level university slots and employment opportunities. 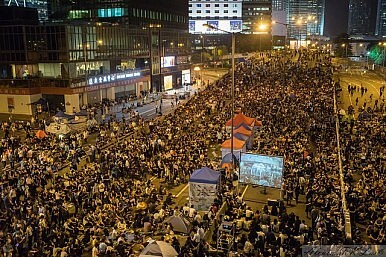 In 2012, massive resistance foiled the Central Government’s “patriotic education” plan. The city’s bubbling resentment towards China is reflected in the polls. The percentage of Hong Kongers who identify themselves as primarily Chinese is steadily declining and was only 31 percent in the most recent poll. Even more significant, the number of young people between the ages of 18-29 who claim an exclusively Chinese identity has dropped from 20-30 percent a decade ago to a mere 4-8 percent today. Unlike their parents and grandparents, most of whom migrated to Hong Kong from China, the majority of young people were born and raised in the city and therefore have a much stronger desire for a separate local identity. It is these young people who have taken to the streets. Beijing’s uncompromising stand has led to their increasing bitterness and may irrevocably steer them towards completely rejecting China and their Chinese heritage. What can Beijing do to reverse this trend? First, Beijing would be wise to grant the protesters’ demand for the unfettered election of their chief executives, or at the very least, make a meaningful concession before the next election. The most pressing grievances in Hong Kong result from the failure of their pro-business government to address the harmful effects that closer economic ties have had on ordinary people. There have already been several mass rallies calling for the resignation of Leung Chun-Ying, the incumbent chief executive. Leung’s two predecessors were also unpopular: Tung Chee-Hwa resigned due to poor performance, while Tsang Yam-Kuen was blamed for increasing the gap between rich and poor. By allowing Hong Kong to truly choose its own chief executives, Beijing will foster goodwill in Hong Kong and give hope to the young generation. More importantly, Beijing needs to promote political and legal reform at home. The primary source of Hong Kong’s alienation from China is not cultural but political. While the majority of the city’s residents may still be attached to “China,” that China is not the People’s Republic, where democracy is absent, the rule of law is limited, basic individual rights are tenuous, and corruption remains rampant. Hong Kong, with its multiparty system, independent judiciary, free press, and constitutional liberties, continues to be worlds apart. In the end, Beijing must take bold measures to reform itself so that Hong Kongers won’t feel ashamed to be Chinese. Ling A. Shiao is an assistant professor at Southern Methodist University who specializes in cultural history, youth movements, and identity politics in modern China. She was an activist in the 1989 Democracy Movement in China. Leaders in Beijing have avoided opprobrium for appalling actions on their behalf.